Take a walk on the lighter side without giving up the rich, chocolaty flavor you love. 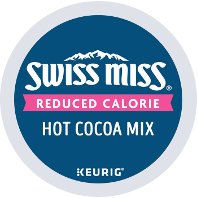 Swiss Miss Reduced Calorie Hot Cocoa K-Cup Packs have 1/3 fewer calories than the regular Swiss Miss K-cup Pack. 1) Store at room temperature. 2) Use the 8 oz. (6 oz. for a richer flavor) setting on your brewer. 3) Press the HOT COCOA/OTHER button if your brewer has this option. 4) After brewing, run a hot water brew cycle without a beverage pod.